Posted on 5 April 2014 at 18:49 in Ham Radio. Say what? A quatrefoil helical antenna is a type of mostly omni-directional antenna that, in this instance has about 3.6 dB gain to the horizon at 137 MHz. Why would you want one? As it turns out, there are 3 NOAA satellites that transmit images in an analog mode called APT as they orbit the Earth. 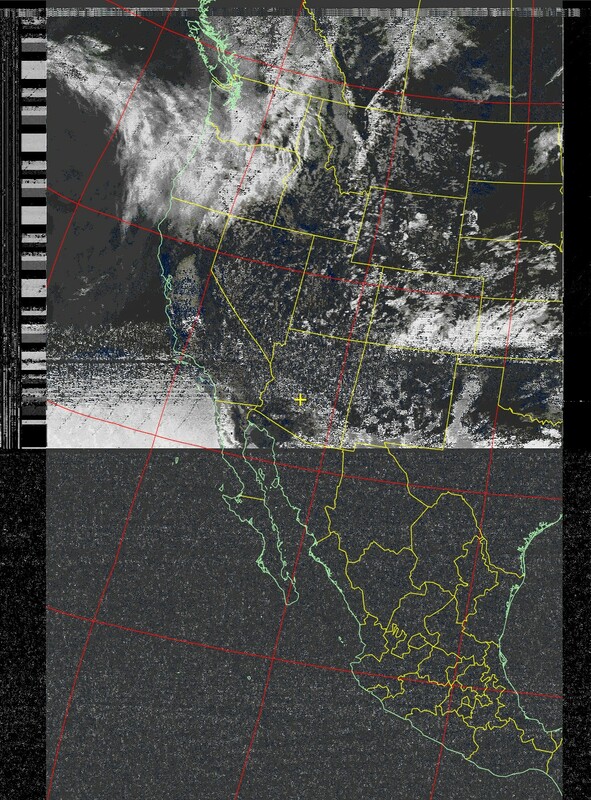 NOAA-15 on 137.620 MHz, NOAA-18 on 137.9125 MHz, and NOAA-19 on 137.100 MHz. The antenna went together fairly well, so Nathan & I took it outside for some initial testing. There were a few satellite passes predicted for the afternoon, so we were able to get some good testing done. Before we look at the results, there’s a few limitations of today’s test that had a direct impact on the results. The first is that I’m using a cheap Baofeng dual band radio. This is a fantastic little unit, especially for the price, but in this case, even at its widest setting, the FM receive bandwidth is too narrow for NOAA APT reception. We still get a large chunk of the data, but a wider receive bandwidth would be clearer at the horizon and saturate less at the ends of the image bands. The other limitation, as you can see in the picture, is that the antenna was zip-tied to a chair in the front yard. Because of this, signals low to the horizon got eaten by both our house, and to a lesser extent, the houses across the street to the north. That said, the preliminary results look great! Our first pass of the afternoon was NOAA-19, and there’s not too much to show for that one. We did get some image data, but we were tinkering with the volume settings on the radio to get it setup right, so there’s a lot of noise from that. The second pass of the afternoon was NOAA-19 again, and this time, we were ready. This pass was at about 30° to the west, so it was fairly low on the horizon. I know from previous testing that with my regular 2m antenna, I can’t get anything at all, but this image with the QFH antenna is pretty good. 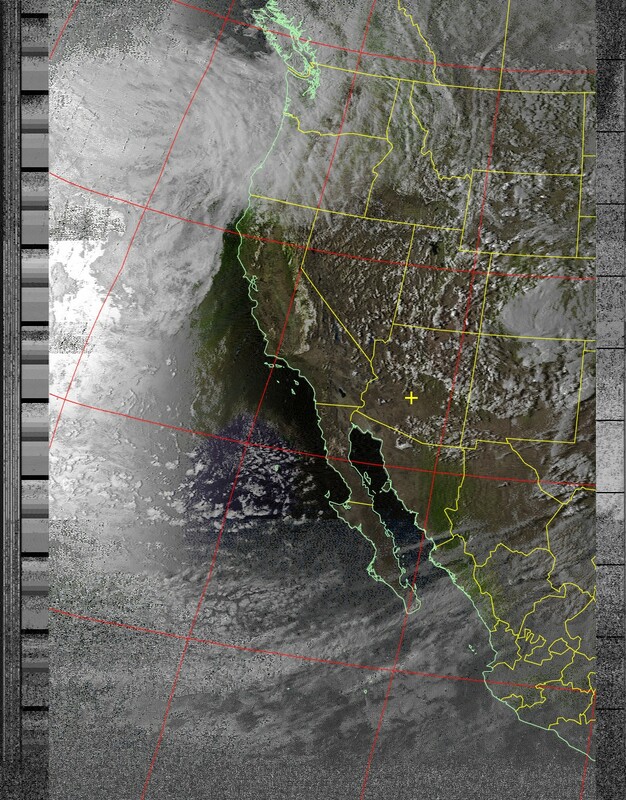 This image is the result of the 2 band image from the satellite being processed and calibrated by wxtoimg, and then with a lat/long grid and state boundaries overlaid for clarity. Note that there’s a little band of noise in the middle; more on that in the next image. 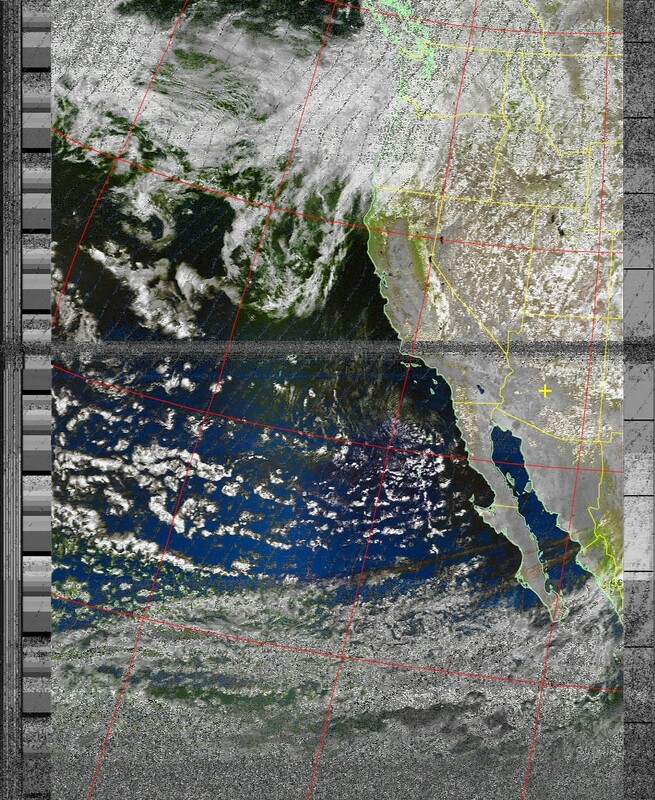 The next pass was NOAA-18, and at a maximum elevation of 88°, it was by far the best pass of the day. Unfortunately, as you can see for almost the bottom half of the image, the radio was programmed with the wrong frequency! As soon as we realized what we going on, we looked up the correct frequency and adjusted the radio as fast as possible. At that point, NOAA-18 was approaching maximum elevation. Just above where the real image data starts, notice how it gets a bit staticy, and then there’s a small dark band of no data, and then a little static again before the image data resumes. It turns out this antenna has a little bit of a blind spot directly above it. The reason it shows on the map around northern Arizona instead of over Phoenix is that our yard slopes a little bit, so the antenna was leaning towards the north by a few degrees. Aside from the frequency snafu, and the small blind spot, the rest of the image looks great. We continued to get signal down to roughly 9° above the horizon which is terrific, especially considering that the horizon was blocked by houses. The last pass of the day was NOAA-15, and this is the image we are most excited about. By this time, we had reprogrammed the radio to have the right frequencies for all three satellites, and we had sorted out the volume controls. NOAA-15 has the weakest APT signal of the three satellites, so we were interested to see what we could do with it. This particular pass had a maximum elevation of 58°, so it was a fairly average pass. As you can see from the image, there was a bit of noise from the south, but that is because the signal had to go through our house first. Once it cleared the house, we got a pretty fantastic image all the way to the opposite horizon (or about 8.5° above it anyway). Based on the results of today’s testing, Nathan & I are very excited about what this antenna can do. Future plans include trying to receive with the QFH antenna using an RTL SDR. If it works, this should fix the bandwidth problem, and eliminate the need to adjust any volume controls. If that works, then the next step would be to mount the QFH antenna on the workshop roof and get a Raspberry PI setup to receive the weather images all the time.